Gene Wolfe  author of The Fifth Head of Cerberus and the 12 books and various stories comprising the "Urth" universe, beginning with The Shadow of the Torturer (1980, first volume of "The Book of the New Sun") and concluding (at least for now) with Return to the Whorl (2001); winner of the Nebula, the World Fantasy Award, and many others  and Neil Gaiman, well-known for the "Sandman" series of graphic novels and more recently for Hugo-finalist American Gods (2001) and current best- selling children's book Coraline  met in 1983 at the British Fantasy Convention in Birmingham, and became friends when Gaiman and his family moved to the US in 1992. They recently collaborated on A Walking Tour of the Shambles: Little Walks for Sightseers #16, published for the 2002 World Horror Convention where they were both guests. 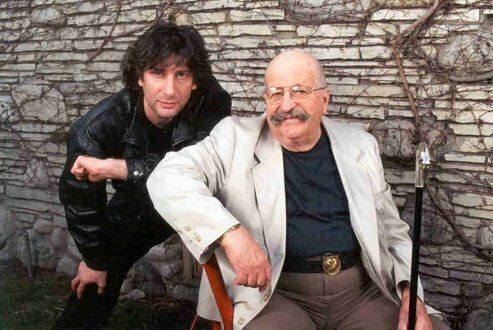 Their "interview" in the September issue of Locus was a series of talks with Gaiman interviewing Wolfe, overseen by Charles N. Brown and Jennifer A. Hall. GW: �I started writing at Texas A&M, for The Commentator, which was the literary magazine. I wrote three or four little stories for it. I wish to god I could remember the name of the editor, because I learned more from the student editor of The Commentator than I have ever learned from any other editor. �He was an upperclassman and I was a sophomore, and I expected to be beaten. We were beaten all the time at Texas A&M. You had to take it  bend down, and they whaled away at you with a big wooden paddle. This happened with alarming frequency, and you never got time to heal. What he did was worse. He got my story and he got a blue pencil, and he edited it there in front of me. As I was standing there, with the drops of blood coursing down my face, I said to myself, �I see what he�s doing. He�s taking out every word the sentence doesn�t require. I�m going to write the next story so he can�t do that.� And I tried to do it. I didn�t succeed, but he was crossing out less in that second story. If it wasn�t for that, I would probably be a bitter old retired engineer, whereas now I�m a bitter old still-active writer." GW: �The most important thing is that it assures the reader that things need not be as they are now. In other words, the most important thing is hope. The full interview, with biographical profiles, is published in the September 2002 issue of Locus Magazine.